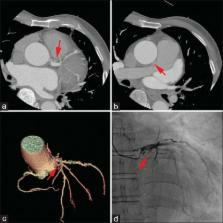 Coronary artery fistulas: clinical and therapeutic considerations. Coronary artery fistulas vary widely in their morphological appearance and presentation. These fistulas are congenital or acquired coronary artery abnormalities in which blood is shunted into a cardiac chamber, great vessel, or other structure, bypassing the myocardial capillary network. The majority of these fistulas arise from the right coronary artery and the left anterior descending coronary artery; the circumflex coronary artery is rarely involved. Clinical manifestations vary considerably and the long-term outcome is not fully known. The patients with coronary fistulas may present with dyspnea, congestive heart failure, angina, endocarditis, arrhythmias, or myocardial infarction. A continuous murmur is often present and is highly suggestive of a coronary artery fistula. Differential diagnosis includes persistent ductus arteriosus, pulmonary arteriovenous fistula, ruptured sinus of Valsalva aneurysm, aortopulmonary window, prolapse of the right aortic cusp with a supracristal ventricular septal defect, internal mammary artery to pulmonary artery fistula, and systemic arteriovenous fistula. Although noninvasive imaging may facilitate the diagnosis and identification of the origin and insertion of coronary artery fistulas, cardiac catheterization and coronary angiography is necessary for the precise delineation of coronary anatomy, for assessment of hemodynamics, and to show the presence of concomitant atherosclerosis and other structural anomalies. Treatment is advocated for symptomatic patients and for those asymptomatic patients who are at risk for future complications. Possible therapeutic options include surgical correction and transcatheter embolization. Historical perspectives, demographics, clinical presentations, diagnostic evaluation, and management of coronary artery fistula are elaborated. Management of coronary artery fistulae. Patient selection and results of transcatheter closure. We report short-term findings in 33 patients after transcatheter closure (TCC) of coronary artery fistulae (CAF) and compare our results with those reported in the recent transcatheter and surgical literature. Transcatheter closure of CAF has been advocated as a minimally invasive alternative to surgery. We reviewed all patients presenting with significant CAF between January 1988 and August 2000. Those with additional complex cardiac disease requiring surgical management were excluded. Of 39 patients considered for TCC, occlusion devices were placed in 33 patients (85%) at 35 procedures and included coils in 28, umbrella devices in 6 and a Grifka vascular occlusion device in 1. Post-deployment angiograms demonstrated complete occlusion in 19, trace in 11, or small residual flow in 5. Follow-up echocardiograms (median, 2.8 years) in 27 patients showed no flow in 22 or small residual flow in 5. Of the 6 patients without follow-up imaging, immediate post-deployment angiograms showed complete occlusion in 5 or small residual flow in 1. Thus, complete occlusion was accomplished in 27 patients (82%). Early complications included transient ST-T wave changes in 5, transient arrhythmias in 4 and single instances of distal coronary artery spasm, fistula dissection and unretrieved coil embolization. There were no deaths or long-term morbidity. Device placement was not attempted in 6 patients (15%), because of multiple fistula drainage sites in 4, extreme vessel tortuosity in 1 and an intracardiac hemangioma in 1. A comparison of our results with those in the recent transcatheter and surgical literature shows similar early effectiveness, morbidity and mortality. From data available, TCC of CAF is an acceptable alternative to surgery in most patients. Prognostic significance of clinically silent coronary artery fistulas. Symptomatic coronary artery fistulas (CAF) are associated with significant morbidity and mortality. With the advent of high-resolution 2-dimensional and color Doppler echocardiography, the detection rate of clinically silent CAF has increased, but their clinical significance and outcome have not been defined. The clinical, echocardiographic, electrocardiographic, and angiographic findings and documented follow-up of 31 patients with an echocardiographic finding of a clinically silent coronary artery fistula from 1986 to 1997 were analyzed. Mean age at diagnosis was 7.2+/-8.4 years. Indications for echocardiography were murmur (n = 23), congenital heart disease (n = 2), cardiomegaly (n = 2), chest pain (n = 1), stridor (n = 1), syncope (n = 1), and chest trauma (n = 1). CAF were detected with color Doppler flow mapping in all patients. The origin of the fistula was from the left coronary artery system (n = 27), right coronary artery system (n = 3), and bilateral (n = 1). The exit sites were the pulmonary artery (n = 18), right ventricle (n = 8), right atrium (n = 2), and left ventricle (n = 3). Global and regional left ventricular function were normal in all patients at presentation and follow-up. Spontaneous closure of the fistula was documented in 7 patients (23%) at mean follow-up of 2.6+/-2.0 years. In 23 patients the fistula persisted without intervention. All patients remained asymptomatic, without adverse clinical events or evidence of ischemia at a mean age at follow-up of 9.3+/-9.1 years (range 4 months to 42.0). Based on this experience, there is no evidence that clinically silent CAF diagnosed incidentally by color Doppler echocardiography are associated with adverse clinical outcome in childhood and adolescence. Conservative management with continued follow-up of these patients appears to be appropriate. This is an open access journal, and articles are distributed under the terms of the Creative Commons Attribution-NonCommercial-ShareAlike 4.0 License, which allows others to remix, tweak, and build upon the work non-commercially, as long as appropriate credit is given and the new creations are licensed under the identical terms. Impairment factors for evaluating the patency of drug-eluting stents and bare metal stents in coronary arteries by 64-slice computed tomography versus conventional coronary angiography. Patient-Specific Three-Dimensional Aortocoronary Model for Percutaneous Coronary Intervention of a Totally Occluded Anomalous Right Coronary Artery.